The courage displayed by Army Sgt. 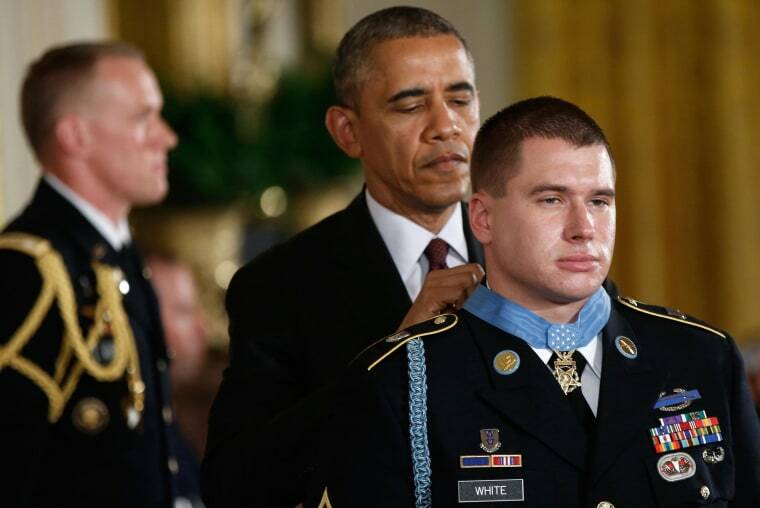 Kyle White when he ran into enemy fire to save his fellow soldiers should motivate Americans "to be the best we can be" to our veterans, President Barack Obama said Tuesday at a ceremony presenting White with the Medal of Honor. White braved enemy fire to rescue a fellow soldier and comfort another in his final moments after U.S. troops were ambushed in a remote and mountainous region of Afghanistan in 2007. "Kyle remembered thinking it's just a matter of time before I'm dead. If that's going to happen I might as well help someone while I can," Obama said during a ceremony at the White House. The Army says White was knocked unconsciousness when a rocket propelled grenade hit near him, sending shrapnel into his face. He awoke to find most of his platoon had gone down a hill for cover, while he stayed behind to protect the wounded and help orchestrate an evacuation. White has since left the Army and now works at a bank in Charlotte, N.C. Obama said that like many veterans returning for war, White has struggled with Post Traumatic Stress Disorder. "You make us proud and you motivate all of us to be the best we can be as Americans, as a nation, to uphold our sacred obligations to your generation and to all who have faced that measure of danger and the willingness to incur it," Obama said.